Jacob emerged limping after his tussle with an unnamed assailant who was probably the symbol of Esau. To recall the pain Jacob suffered in his thigh, Jews do not eat an animal’s gid ha-nasheh, “the sinew that shrank”. Dayan Grunfeld points out that the event that motivated this prohibition must have been important enough to justify being symbolically present throughout the ages. 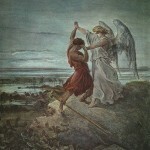 Grunfeld’s explanation is that Jacob’s struggle with the assailant “is a prototype of the struggle which goes on throughout history between the moral law represented by Jacob and brutal force as championed by Esau… a symbol of our nation which will never be defeated by the materially stronger force of Esau, although it may, like our ancestor, suffer from wounds and temporary afflictions on its journey through history” (“The Jewish Dietary Laws”, vol. 1, pages 19-20). There are additional laws of kashrut which show the difference between Judaism and other cultures. As against our prohibition of mixing milk and meat (Ex. 23:19 and 34:26, and Deut. 14:21), the 14th century BCE Ras Shamra texts say, “Seethe a kid in milk”. Defying heathen ways is not the only explanation. Some think eating milk and meat together caused disease. Others say it is ethically repugnant to boil a kid in its mother’s milk and we must not do what is repugnant. This entry is filed under Parashah Insights, Vayyishlach.